I posted about this ages ago, but finally ready to do something about it. I received several old quilts from my former boss, quilts that his grandmother made. One of them had been ripped into by his dog. I am going to attempt to repair it. The quilt is appliqued butterflies. There are 3 blocks that are in very bad shape, and those are what I will try to repair. So, my first step will be to cut out the butterflies (they, luckily, are save-able as is, not shredded). I will then applique them on to a new square of background fabric and applique that square on top of the shredded square. I hope that makes sense. My 2 questions are : how to "age" the background fabric so it matches the quilt, and how to re-quilt those squares. Thanks in advance. age the background fabric? does the background look tea dyed? if so you could do that. it just makes it beige looking. i'm not sure what you mean exactly. re-quilting, is it machine quilted or hand quilted? Find the closest fabric match you can. A slightly off white like Kona snow might work. Redo the quilt in whatever way makes it work for you. When it is all finished. Use Retro Clean and soak the whole thing. You will be shocked at how white the old blocks will be. This is available at many quilt stores and Amazon. Looks very changeling, good luck and I give you a lot of credit. Let us all see it when you are done. I would try the retroclean as suggested. I only want to say that since that area is in really bad shape, any repairs you make will move the quilt's life forward 100%. I hope you don't stress too much that the repairs are not invisible. So wow that is really damaged. You have a challenge ahead of you. Are those the only damaged areas? Thanks for the suggestions; I had not heard of retroclean, I am eager to try it! This quilt is in deed a challenge; my first thought when I received t was to make teddy bears out of it for my bosses 2 step-grandchildren. When I posted that idea on this board, it was met with a bit of chastisement. And the responses were such that I thought well, maybe I CAN and SHOULD try to repair it. So, I am finally going to try, and if it doesn't work, well then no harm done, since it is in bad shape. This is the only part of it that is really shredded-only about 3 blocks. The rest is just normal wear on the fabric, which gives it a comfy/homey feel and I don't mind it. I took one apart all the way down the blocks. Re-appliqued a few blocks, put in new sashing that matched the old as closely as I could, and added some new tiny appliques to cover up a few holes. It can be done. 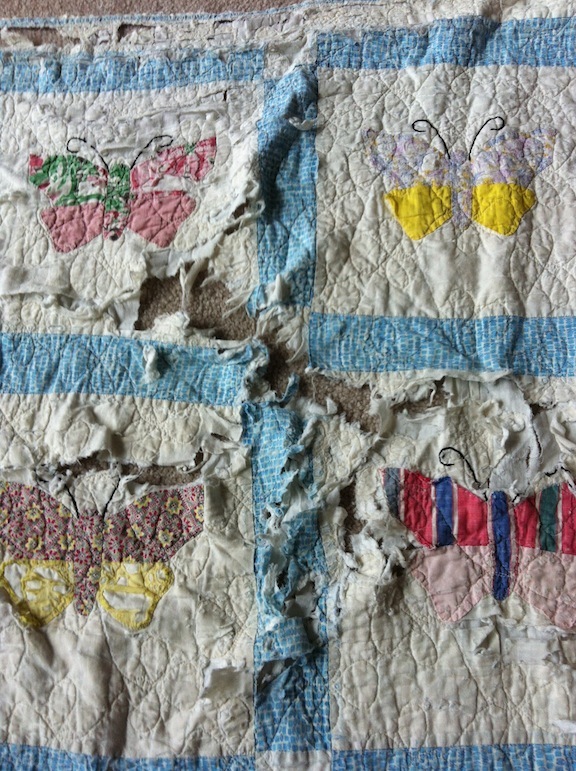 In fact, it's kind of rewarding to save an old quilt. Wow, I give you a lot of credit for trying! If it isn't possible to replace the three damaged blocks, you could also remove the entire row and end up with a smaller quilt. Any blocks that can be salvaged from the removed row could be used to cover a pillow. Or, as you originally thought, make a teddy bear. Although it's ideal to try to save a quilt, sometimes it just isn't possible and we shouldn't feel guilty when it can't be done. I'd try with some small fabric pieces using tea dye or diluted bleach until I got close enough to use. If the quilt is hand quilted, then you should do the same. If it's machine quilted then try on a sample to duplicate it and go for it. You have quite a challenge before you but you will feel really good when it is done. Looks like a huge challenge - good luck with the project. Let us see the results. I would not chastise you AT ALL if you decided to make pillows out of the good blocks. Best of luck in whatever you decide.